The tip of Croydon transmitter framed by Crystal Palace. 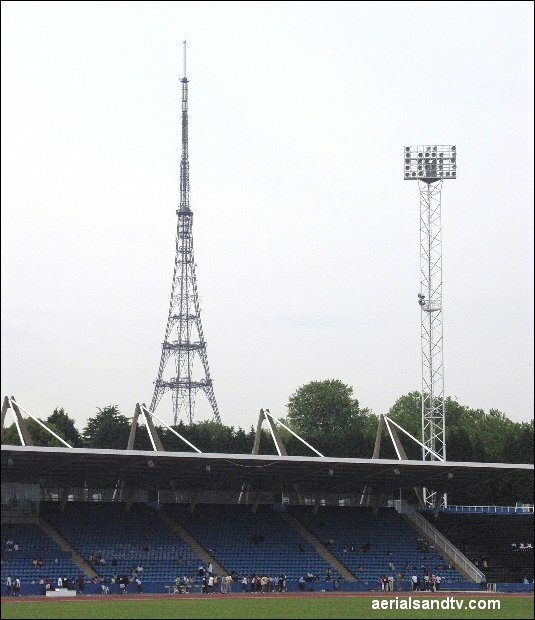 Crystal Palace television transmitter from the athletics track of the same name. Those situated to the North or NW of Crystal Palace may find that during certain weather condition they can suffer from co-channel interference as their aerials are pointing towards the continent. Also see other relevant A group curves. * If you particularly want MUXES 7 & 8 then we recommend the DM Log, the Log36, the Yagi 18K or the DY14WB. 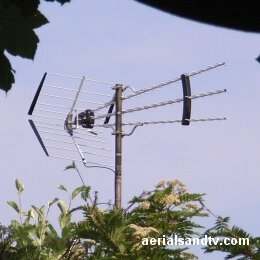 Both these aerials were spotted in Purley On Thames, just west of Reading, and they`re both on Crystal Palace transmitter which is about 40 miles away. The thing is, they`re the wrong aerials for Crystal Palace, or any A group transmitter come to that. I`m not familiar with the signal strength in this location (though the one on the left was on a bleedin` high pole....) but whether it`s a strong or weak area the installer has still fitted the wrong aerial. Well if it`s a weak reception area an A group aerial should have been used. The thing is a Log36 is smaller than a Tri Boom so some installers find it harder to justify their (large ? ) bills..... Any connection ? Or am I just getting cynical as I get older ? In my opinion if any installer tries to sell you this type of Tri Boom aerial for Crystal Palace (or any other A group transmitter) you can quote me that he’s fitting the wrong antenna. 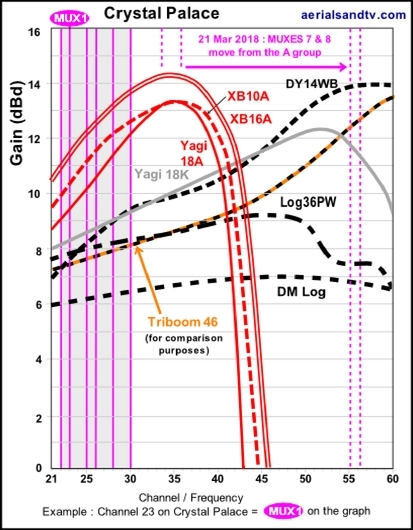 Although I think Tri Booms are over rated (particularly for frequencies at the bottom of the band) it`s possibly a little unfair to pick on them because all of the comments in this article apply (to a large extent) to any wideband Yagi type aerial, whether X Beam or not. But all Tri Booms are wideband so at least I can be sure what I`ve photographed ! See this customer Aerial Report. Crystal Palace transmitter is situated 6 miles South of The Tower Of London, though it was built rather more recently than the latter, in 1950. The tower is 222m high (see How High is High ? ) and in some ways looks similar to the Eiffel tower in Paris, although the French structure is taller at 318m. I have often wondered why the owners of Crystal Palace don`t learn from their Parisian counterparts and build a public viewing platform. I`m sure they would recoup the investment many times over, after all it`s far higher than, say, “The London Eye” ! There`s probably some Health & Safety B******s ruling to stop it...... On the subject of views of London, see this panorama from the top of the Post Office Tower (and that`s the Post Office tower, not the BT Tower……). Crystal Palace site gets its name from the original Crystal Palace which was built for the Great Exhibition (of 1851) and moved to this site in 1854, unfortunately it was tragically destroyed by fire in 1936. Also located near the tower is the National Sports Centre of 1964. For years this housed London`s only 50m swimming pool (until a second one opened in Ealing) but it also has various sports halls plus the the well known athletics track. In the old 405 line VHF days the transmitter only broadcast the BBC and a second similar design (152m in height) was constructed in 1962 for ITV* at Croydon. When UHF started transmission in the 60`s (1964 from Crystal Palace) the distinction between BBC and ITV broadcasting sites was discontinued and everything was transmitted from Crystal Palace. In fact in 1985 when the VHF signals were finally switched off it seemed Croydon`s days as a TV transmitter were over. However that wasn`t quite the end of the story because when Channel 5 began broadcasting in 1997 Croydon was given the job of transmitting it to the London and SE area, though it wasn`t transmitted at full power to the south so as not to cause co-channel interference in France. These analogue C5 transmissions continued until digital switchover on the 18th April 2012. Now Croydon is only used for radio transmissions (not BBC). * This double transmitter scenario was also used for (BBC first) Sutton Coldfield / Lichfield, Holme Moss / Emley Moor , Pontop Pike / Burnhope, Kirk O`Shotts / Black Hill, Wenvoe / St Hilary, Divis / Black Mountain and Sandale / Caldbeck, Ashkirk / Selkirk (amongst others). Also see basic digital fault finding and the wrong aerial for Crystal Palace. nothing changed apart from MUXES 7 & 8 (see graph). Those with A group aerials who want those MUXES will either need to change their aerial for a wideband (but which has less gain), or add another (e.g. a Yagi 18E) using a CH38 diplexer as a combiner (see this article). Crystal Palace transmitter`s population coverage is unsurprisingly the highest in the UK at around 11 million. It obviously broadcasts to London but also to much of the south east including as far as Reading, or even further if the altitude or “line of sight” of the location is good enough. See this customer Aerial Report, and the wrong aerial for Crystal Palace. Crystal Palace TV transmitter up close. See Crystal Palace`s height in relation to other transmitters. 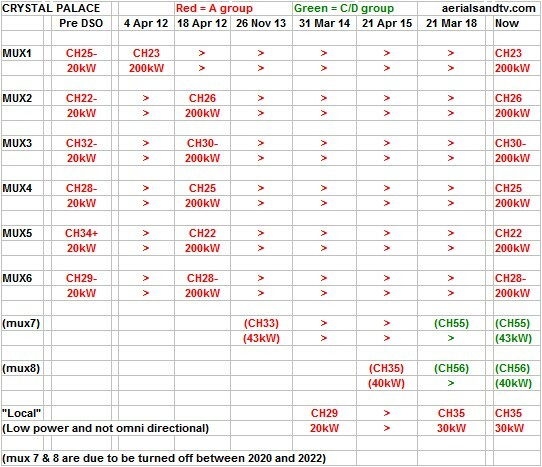 This channel allocation guide for Crystal Palace also includes the same information for most of the other major transmitters receivable within the coverage area of Crystal Palace, i.e. Sandy, Sudbury, Bluebell Hill, Dover, Tunbridge Wells, Heathfield, Reigate, Midhurst, Guildford, Rowridge, Hannington, Oxford and Hemel Hempstead. This data can be of great use in determining possible alternative transmitters to try if Crystal Palace fails to give an adequate signal, the importance of “Line Of Sight”. Note how most of the broadcast channels from the various transmitters “Dovetail” together but it has not been possible to eliminate potential co-channel problems. The Channel Allocation Guides can be very useful in the diagnosis of co-channel interference problems and can also be invaluable if you are trying to find a spare channel for a modulated output (e.g. for a Sky box or CCTV system) to be added to your TV setup/distribution system without suffering from co-channel. Also check Crystal Palace`s fifty six * smaller relays, quite a few of which are horizontally polarised (as is Crystal Palace). * Counting dual polarisation transmitters as one, and not counting Biggin Hill link. Crystal Palace transmitter has about about fifty smaller relays of which 8 are horizontally polarised which could be important to bear in mind if you are trying to confirm which transmitter you are on ! There is one ”Local” channel allocated to Crystal Palace on CH35. Crystal Palace transmits a horizontally polarised signal and it was, is, and is due to remain, an A group transmitter (excl MUXES 7 & 8). For Crystal Palace we recommend the DM log for strong signal areas, the Log36 or Yagi 18K for medium signal areas, the Yagi18A* for outside installs in poor signal areas, the XB10A* for loft installations in poor signal areas, and the XB16A* for those with the most marginal signals. Unless you have a massive loft we`d normally recommend the XB10A over the XB16A for a loft install due the smaller size of the former aerial. * The A group aerials will not pick up MUXES 7 & 8, if you particularly want to receive those MUXES we still recommend the DM log for strong signal areas and the Log36 or Yagi18K for medium signal areas, but for weak areas we`d recommend the DY14WB, though you will lose gain on the 6 main MUXES compared to an A group aerial. 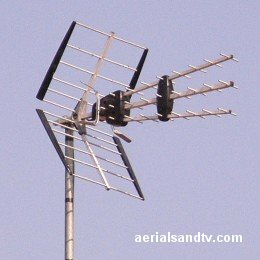 Alternatively, diplex a Yagi 18E with your existing A group aerial (using a CH38 diplexer) to get high gain across the whole band. See this article about diplexing an A and E grp aerial to get MUXES 7 & 8. The dimensions and test performance of the aerials can be found on the relevant tables.